Our Retro Shop is unique since we are a fine art hand crafted furniture, door and hand forged hardware manufacturer. Our retro shop has direct access to be able to - as needed - re-manufacture any item in the same hand and materials, parts, and process that cannot be found in the general market. This allows us to restore most items to their original factory fresh state, no matter the age or condition, allowing for the most authentic and investment value restoration that can be done worldwide. At our retro facility, a restored antique or new product is guaranteed to be the best built or restored to world class collector standards. Antique gas pumps, vintage Coke machines, antique furniture, or automobilia restoration is the process of repairing the degraded aspect of a classic or vintage furnishing to return it to an overall "authentic" condition. Your satisfaction is guaranteed. All antiques, artifacts, or vintage restoration products are guaranteed to be as represented, upon delivery and your inspection, or we will refund your money and pay the freight both ways - all backed by over a century of fine craftsmanship. Note: This information is offered so you may fully understand what you are ordering when you order a vintage artifact or have ArtFactory.com restore your antique or vintage items. To renovate an item without updating or upgrading is by keeping it in line with how it would have appeared when first offered for sale. Non factory paint codes and even paint schemes, interior and chrome trim of the time period may be used if they were commonly shared between similar models of the era so as to look the part. Many restored collectibles may lose their original engines and have a similar capacity or model related engine installed, for example a vintage Coke machine may have an upgraded compressor and fan. A complete vintage restoration includes not only repair of the parts that can be seen - the body, the trim, the chrome, the accessories - but the parts that are not necessarily visible or otherwise evident, including the pipes, pumps, engine and the motor compartment, the inside and under side, the frame, the mechanical, and all ancillary parts like the electrical system, levers, accessories, etc. Besides repairs done to correct obvious problems, repairs are also done for cosmetic reasons. For example, even if a part is covered by a door and not seen, and is structurally sound, it should have the insides unmounted, then any required repairs such as rust removal, straightening, priming and painting. Restoration is sometimes confused with the term "restomod. A restomod places some portions of the classic collectible item as they were when the item was first offered for sale, and changes (updates) others. If any part of the item is updated, the classic item has been "restomodded," and not restored. An "original restoration" puts a vintage collectible in the same condition as when it was first offered for sale. Many antiques, rare cars, and gas pumps may not be able to have a true to original restoration done because some parts may not be available to replace or to imitate fully, yet with the proper research, they may be restored to an overall authentic condition. A complete classic vintage restoration, could include total removal of the body, any pumps, engine/motorized components, and related parts from the vintage items, total disassembly, cleaning and repairing of each of the major parts and its components, replacing broken, damaged or worn parts and complete re-assembly and testing. As part of the restoration, each part must be thoroughly examined, cleaned and repaired, or if repair of the individual part would be too costly, replaced (assuming correct, quality parts are available) as necessary to return the entire vintage collectible to it's "as first sold or better" condition. All of the parts showing wear or damage that were originally painted are typically stripped of old paint, with any rust or rust related damage repaired, dents and ripples removed and then the metal refinished, primed and painted with colors to match the original factory colors. Some vintage items will include worn or pertained original parts showing its age and wear. Wooden parts should go through the same meticulous inspection and repair process with re-gluing, replacement of rotted or termite-damaged wood, sealing and refinishing to match the factory specifications. Upholstery and trim may require stripping and repair/refinishing or new material. Fasteners with tool marks, damaged threads, or corrosion need re-plating or replacement-unless the classic collectible item was originally sold that way. The frame and metal housing must be thoroughly cleaned and repaired if necessary. Often sandblasting of the frame is the most expeditious method of cleaning. The frame must be properly coated to match the original. The interior of the vintage or antique item should be examined and repaired/replaced to match those that were available from the factory. Chairs' seats must be repaired before being re-upholstered and the coil springs repaired, replaced or retied. The inner workings, instrument panel, wood arms, feet, dash board, and any gauges, each of which have to be inspected, need to be cleaned/repaired/replaced to be brought back to both operational and cosmetic standards of the item when it was first sold. Before and after in a complete restoration, the repair and refinishing of the antique's exterior body and frame must again go through the careful inspection and subsequent repair, and recoating as necessary to bring the collectible item to "as first sold" condition. As part of the vintage restoration process, repair of the collectible's frame is important since it serves as the foundation for the entire item. The frame should be inspected for straightness, twisting, alignment, rust damage, wood rot and condition of the mounting points for the body and other components. Any problems must be repaired, which can be a costly process. For many popular collectibles, replacement parts can be purchased from parts suppliers specializing in that type of vintage collectible. This is often a better option than investing money into a severely damaged part. If rust is present on a body panel, the panel was damaged by an impact, or other damage is present, there are several options for repair: fix the damaged panel (minor damage), replacement (excessively damaged panels), or cutting out and replacing a portion of the panel (moderate damage). Although, this may seem simple in principle, in practice it is highly skilled work. One of the highest skills in restoration is the use of the English Wheel or Wheeling Machine. Many panels, especially if from different sources, may be a problem to fit together and need reshaping to fit properly. Variation in panel size and shape and 'fettling' by skilled metalworkers on the factory production line to make panels fit well, used to be common practice. Even genuine New Old Stock factory panels may require panel beating skills to fit. The doors, lids, or drawers should open and close properly, and there should be no interference or rubbing. Wood, steel or aluminum door skins and wing/fender edges can be generally be adjusted with a hammer and dolly. In extreme cases, a pulsed MIG weld bead on a panel edge that is shaped with a grinder can be good solution. At one time it was common practice to use lead loading to achieve tight panel gaps, especially in the coach-building business, but also on the production line. The panels have to 'look right' together. This is a process of repeated adjustment, because the adjustment of one panel often affects the apparent fit of another. If there are multiple styling lines on the side of a collectible vintage item, it is generally best to align doors on the most prominent one. When we are satisfied with the panels on the antique, they will be primed and painted a correct historical color for the collectible (although this is debatable - the owner might want to have the item painted to his or her specifications to match a room or location). Individual painting of the panels is generally the correct approach, as this will result in all parts of the panel being painted as opposed to partially re-assembling and then painting, leaving parts of the assembly that are touching or "blind" unpainted. It is useful to mark in some way, if possible, where the panels fit before removal for painting, to aid re-fitting. The separate painting approach should also result in no over-spray on other parts of the item since they will not be on the collectible item at that point. It is important when re-assembling painted panels, to be aware that the paint is at its thinnest, and most easily damaged, on corners, edges, and raised styling lines, and to take extra care with them. This is also important when using ultra fine wet flatting paper before polishing, (or when using an electric polishing mop) for the best mirror like finish. Colors and treatments applied to the panels from the factory should be considered. An owner may wish to have a panel or portion of the vintage collectible entirely painted when in fact it may have come from the factory with undercoating or other coating applied to one side, which may be less attractive than a smoothly finished and painted panel. In other cases, the owner might paint or plate a collection of small parts to look similar for a better appearance, when the factory might have installed these as many different colors since the factory's prime concern was function and not appearance. This makes the collectible a "Restomod", and not a restoration. The entire engine, pumps or motorized components and all related systems, when included, are inspected and whatever is necessary to get them into original pre-sale condition is done. The engine and all of the ancillary components must be inspected and corrected to factory specifications. All moving parts must be cleaned and measured against factory specifications and, if necessary, machined or re-manufactured to bring them within specifications. All of the electrical system has to be inspected and, if it shows wear or damage, replaced. Finally, the engine/compressor has to be re-installed in the frame, the other parts re-installed, the body fitted to the frame and the entire collectible rechecked and tested. Vintage restoration of an antique collectible is a daunting task, not one to be undertaken lightly, or by the inexperienced. A full restoration can take many years by some individuals and can cost tens of thousands of dollars; often, and generally, well in excess of what the finished value of the collectible will be. At ArtFactory.com we get this job done in the fastest amount of time - most can be done in less than 95 work days. There are different levels of old Americana repair and restoration. The highest quality level, (generally unobtainable for the amateur restorer,) is the Concours d'Elegance level; these are vintage collectibles that are frequently restomoded to a degree often beyond the quality that they were when they left the factory. There are virtually no deficiencies in the quality of the parts that were actually restored. Those parts that did not come on the collectible as it was first sold must have the highest level of fit and finish, and appear to have been original parts. Many Concours d'Elegance vintage items are not used except for the short times for shows. Only when an old Americana collectible is completely placed back into the condition it was first sold in is it considered to be restored. Various aspects of a collectible may be repaired without the item being restored. A collectible that does not run can be repaired to running condition, but that simply means it will now run and does not mean that any part of the car or pump, coke machine etc. has been restored. Restoration means that the collectible was put back into the condition it was first sold as. Anything else is either repair, or restomod. Many value guides offer six levels of quality, from a "parts-only" collectible to a Number 1 - absolutely perfect in every way, museum investment quality, world class collectible. 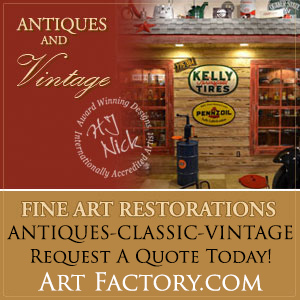 We offer this information so you may fully understand what you are ordering when you have ArtFactory.com restore your antique or vintage collectibles. Please contact us with any questions about our vintage products and classic restoration services, 1-800-292-0008. We build complete, historically correct, vintage man cave displays that are authentic in every detail, such as filling stations, soda fountains, drive-ins, and many other environments - in any era you wish to create for your enjoyment or business. We pre-fab entire, free standing, fully functional historical sets, in full detail for store fronts, your favorite "back in the day" hang-out, outdoor or indoor displays to fit any specifications. Simply send us your photos, drawings, or description and we will design and build to your specifications. Learn more about our Man Caves and vintage products we have available.